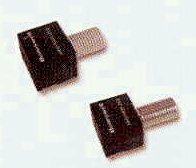 SERCOS transmitters convert optical input into electrical signal and are designed for data transmission in industrial LAN applications. SERCOS receivers provide digital output to indicate presence or absence of light, and sealed products have reverse polarity and overvoltage protection. Duplexers contain two devices per module so they may communicate in opposing directions simultaneously and independently. May be used to multiplex two signals to a single fiber and where dual fiber solution is neither possible nor economical. Slope efficiency 0.35 mW/mA typ. – – 0.2 mW/mA typ. Forward voltage 1.2 V typ. – – 1.8 V typ. Threshold current 12 mA typ. – – 3.6 mA typ. Spectral bandwidth 2 nm typ. – – 0.85 nm max. Response time 0.5 ns max. 3 ns max. 1 ns max. 300 ps max. Reverse voltage 0.5 ns max. 3 ns max. 1 ns max. 300 ps max.